Born into the warrior culture of a military family, Daniel Buttry’s Christian faith led him to become a nonviolent activist. 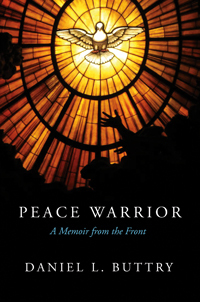 Peace Warrior provides an inside, firsthand look at peace training, nonviolent struggle, and mediation in conflict zones around the world. Buttry reveals the stories behind news headlines of conflicts or peace accords. He escorts the reader into the shadowy world of guerilla leaders, traumatized victims, and ordinary people who become agents of peace against incredible odds. Exploring the labyrinthine processes to bring peace to two particular long-standing armed conflicts in Asia, Buttry provides a peek into historical events, and their behind-the-scenes developments. He shares freely the hopes, fears, frustrations, courage, failures, successes, humor, and faith that are all a part of making a difference for peace at the fault lines of violent conflict. He takes us into the challenging world of inter-faith peacemaking at a time when religious differences are highlighted in many of our global conflicts. Peace Warrior is set at the front lines of conflict, but is infused with a bright hope from Buttry’s work alongside little-known heroes who have built peace amid the harshest environments.